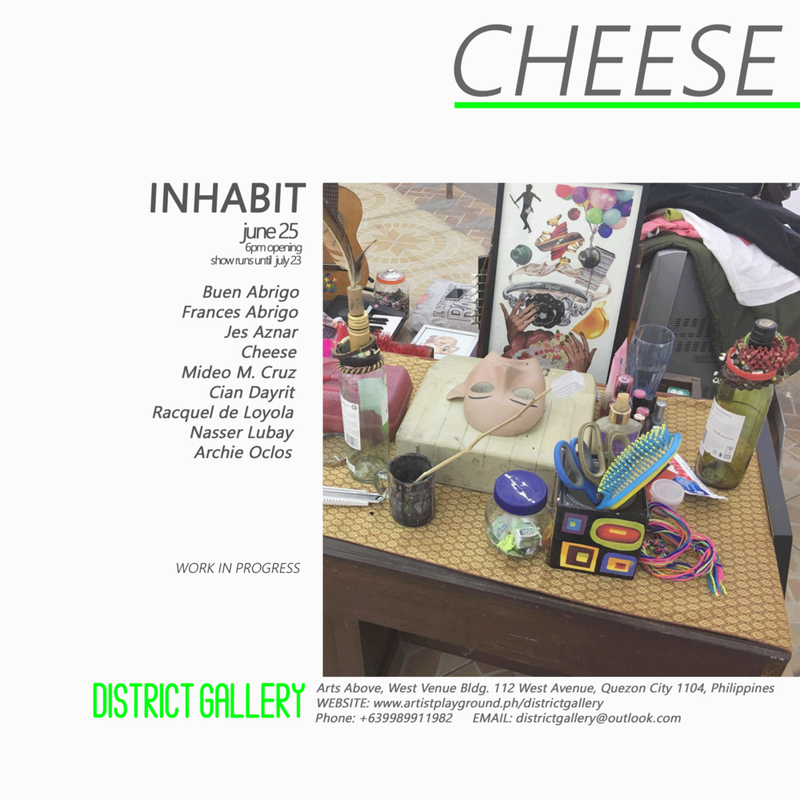 District Gallery is a newly organized art gallery located at Arts Above, West Venue Building along West Avenue Quezon City and is s founded by the ARTIST PLAYGROUND, an arts and performance company. The gallery aims to inspire, engage, excite and connect people through contemporary art. It is committed to providing a collaborative space and environment for emerging and established artists and likewise aims to maximize local and global opportunities thru institutional partnerships. Fittingly, the inaugural show Inhabit showcases District Gallery as much it is about the exhibition. "Inhabit" thematizes on change, adaptation and speculation of reuse and negotiating the indelible traces of previous use and function as in this case, portions of a tax collection office that has been left unused and underutilized for a long time. With this premise and context, various artist came up with different creative responses to dramatize such act of take-over and settling-in beyond the confines of spaces but possibly of habits, traditions and ideas. To open this new space is an act of embracing possibility. The organizers of this newly christened art space believe that artmaking can be produced and displayed anywhere beyond the usual precincts of art. But more importantly, the gallery aims to be not only a place to view art but also to act as a community hub in which artists of all kind and disciplines as well as their followers can come to experience in ways the gallery can offer such artistic and cultural encounters. "Inhabit" gathers together artists of different creative persuasions, all of whom has made their own mark in the local and international art scene. These are: Mideo Cruz, Raquel de Loyola, Jes Aznar, Cian Dayrit, Buen Abrigo, Frances Abrigo, Cheese, Archie Oclos and Nasser Lubay. Inhabit is a word of action that concerns the occupation of a space to claim it as a place. Something places itself in a space to form a location, a site, a position. Something embeds a habit, a routine, a pattern to break away from movement, transition and things in the state of the provisional. To in-habit is to settle, and to settle is to humanize a landscape. When our ancestors veered away from the nomadic way of life to start cultivating lands and practice agriculture, multiple and different tribes of the earth claimed their own spaces and declared them as the places of their identity, the places of their origin. They gave birth to culture, language, ritual, customs, traditions and socio-political structure because of this path to settlement. Later on this settling paved way for property, security, hierarchy, trade and warfare which in return destroyed the very place of identity that they themselves built; only to incessantly reconstruct what has been destructed in a different form and under a newer order. All these historical tendencies of cyclic spatial regeneration are made manifest in the works of 9 artists in collaboration for a reclamation. This retrieval, recuperation and renovation remakes space not as an abstract arena but a place of production and reproduction that is dynamic and relational. These artists enter this persistent space of recreation to restore and refresh our active sites of knowing. Aznar and Dayrit for example, enters our common area of meaningfulness by making visible old objects and events that engage this very space we now hold to the wider historical space it is part of. In the same trajectory of reinvention and reconnection as junctures of political engagement between the viewer, the artist and the society, the works of De Loyola and the Abrigos are metaphors of specific social issues that tackle spatial occupation as an assertion of political power and will. This same metaphor is pushed forth in the mythologizing of Olcos’ works, and the funnier engagements of Cruz that crackles an inner laughter as it criticizes social ills. However, the personalization and celebration of privacy figure in the works of Cheese and Lubay as both recreate their own creative spaces to publicize the process by which a work is done, languaging the space in the narrative of the meta. From the social sphere to the private self, Inhabit is a cooperative rebirth of space and place that creates a dialogue between mutability and fixity. As these works occupy the gallery space, an allowance for the place to take its own shape is also commenced. The very encapsulation of form initiates the sheer liberation of meaning. A fine arts senior at the University of the Philippines. he is slowly establishing a reputation as one of the most promising emerging artists in the country today. 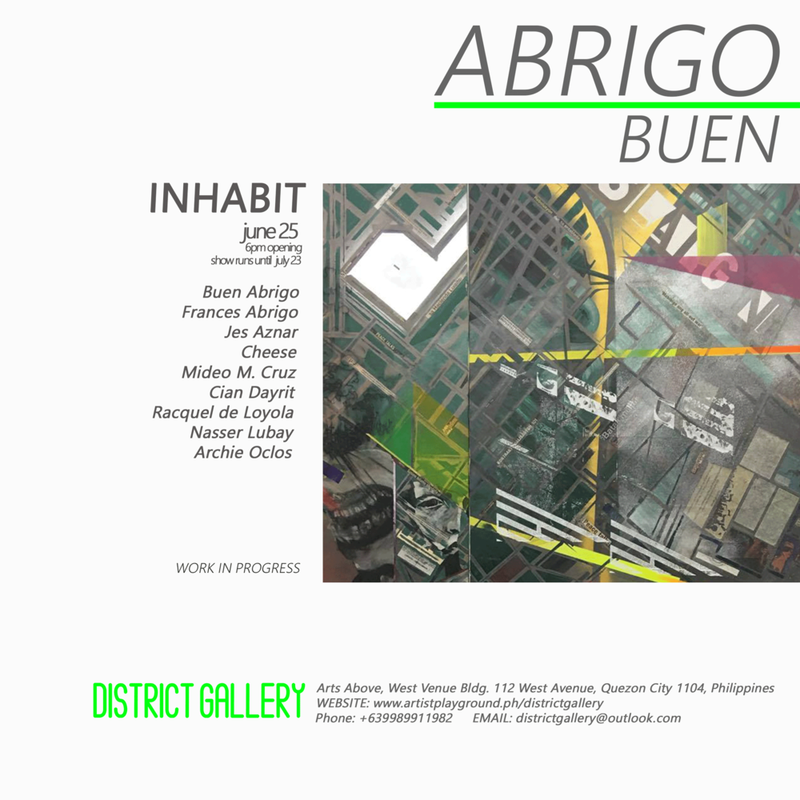 Abrigo was a two time-finalist in the PLDT DPC Annual Visual Arts Competition held in 2005 and 2006. In 2005, he was also a finalist in the Metrobank Art and Design Excellence Awards. That year he also earned seventh place distinction in the Shell National Students Art Competition. Frances Abrigo is one of the artists that travel across the city expressing themselves through graffiti with a stencil and spray-paint in hand. In his first solo exhibition, a fresh set of works are situated within a site that is entirely different from any typical street in Metro Manila namely an art exhibition space. Out in the streets, images from stencils are usually repeated in every corner as many times the artist possibly could under given circumstances. The way they convey messages are usually short and straightforward even if sometimes they are not fully understood by an ordinary passerby. Jes Aznar is a full time documentary photographer based in Manila, Philippines, covering Asia, Pacific and beyond. The New York Times regular contributor, Co-founder @everydayphilippines on Instagram. Partial client and publication list: The New York Times, The Washington Post, Getty Images, Wall Street Journal, Bloomberg, International Herald Tribune, California Sun day Times Magazine, Asian Development Bank, UN World Food Programme, International Committee of the Red Cross. Mideo M. Cruz is an active cross-disciplinary artist-organizer based in Southeast Asia. His works shows strong allegorical images of the social order. In 2011 he became controversial when his installation “Poleteismo” in Cultural Center of the Philippines was strongly objected by the Catholic Church which ended up in exorcism rituals and a Senate hearing. Among his merits is the 2003 Cultural Center of the Philippines Thirteen Artists Award, the 2003 Sungduan Grant and the 2006 Ateneo Art Award. Cian Dayrit is an intermedia artist working with painting, sculpture, and installation. Straddling between fact and fiction, Dayrit’s works explore origins and histories, and their re-presentations in visual apparatuses, from the map, curiosity cabinet, and on to the museum. He received a bachelor’s degree in Fine Arts from UP Diliman in 2011, where his final project titled Artefact X was awarded Most Outstanding Thesis. His recent solo exhibitions include Spectacles of the Third World at Tin-Aw Gallery (2015); Polycephalous at Art Informal (2014); and The Bla-Bla Archeological Complex at the UP Vargas Museum (2013). He participated in the group exhibition titled Exposition at the Lopez Memorial Museum in 2016. Racquel de Loyola is part of the former KANTO Artist Run Space in Makati City Philippines. She was shortlisted artist for the 2007 Ateneo Art Awards in Manila Philippines. A recipient of the Cultural Center of the Philippines 13 Artists Awards in 2009. De Loyola received the Asian Cultural Council fellowship program artist residency in New York in 2012. She has presented her works in various exhibitions and performance art festivals locally and abroad. De Loyola had previously presented her piece in titled “Blinded” Performance and Justice: Representing Dangerous Truths Symposium at the Black Box Theater in John Jay College in Manhattan in 2013. “Fulcrum” a performance collaboration project with Mideo Cruz’ was presented during the event “Art Subversives ” at Grace Exhibition Space in Brooklyn New York in April 2013. “Frozen Action” is a compilation of her previous performance documentation which was exhibited at the Bliss on Bliss Project Studio in Queens New York in April 2013. She was one of the artist participated for the Triumph of Philippine Art exhibition presented at the George Segal Gallery at Montclair University in New Jersey USA in September 21-December 15, 2013, presented at the USC Fisher Museum of Art in Los Angeles California in February 5 to April 13, 2013 and finally a homecoming exhibition last July 21 to August 31 2014 at the Ayala Museum. Nasser Lubay is self-taught visual artist based in Manila, Philippines. He won 2nd Place in the Celeste International Art Prize in Berlin, Germany. He was chosen as one of the Young Ambassadors of Jollibee representing the arts and was part of the 50 highlighted artists in the acclaimed first international travelling biennial, 2nd Animamix Biennale: Visual Attract and Attack. He was part of the 2010 Ondarte International Artist Residency in Akumal, Mexico. He was also shortlisted in Celeste Prize 2010 Digital Graphics and a finalist in Kuala Lumpur Design Week 2009. His art is an abstraction of captured moments fused in a mixed of pop, psychedelic, surreal, and fantasies. His visual composition starts from a flow in his hand forging into biotic, organic and geometric outcomes. He then meticulously strokes his vivid colors with a dimensional effect on the artworks. Archie Oclos is a Senior Concept Artist in a Gaming Company, a street artist, and a painter. 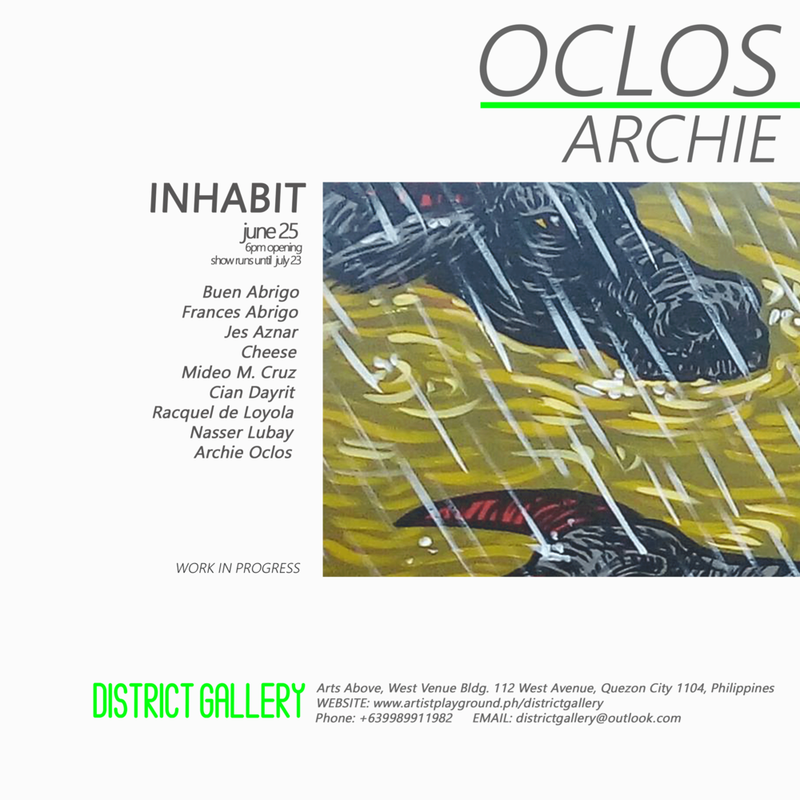 With multiple awards in national art competitions, Archie has held his own solo exhibitions and participated in many group exhibits over the last few years. District Gallery aims to inspire, engage, excite and connect people through contemporary art. It is a committed to providing a collaborative space and environment for emerging and established artists. It aims to maximize local and global opportunities thru institutional partnerships. The gallery is founded by the ARTIST PLAYGROUND, an arts and performance company.